From the outset of the segmental retaining wall (SRW) products industry in the early 80’s, the use of the products has been plagued with misinformation from a methodology, construction and inspection standpoint. The concept of dry stack interlocking concrete blocks economized the way land can now be developed in an environmentally friendly and cost-effective manner. Retaining walls are seldom wanted on a project, but are often needed to secure more buildable land on any given site. As the SRW industry continued to grow, competitors brought many variations in product design to the market. Some competitors, in the attempt to gain market share to their product, pushed specific misinformation about the performance of their particular block’s features compared to others. The Myth of Mechanical Connection was possibly the largest and most damaging to the entire SRW industry. Over the past 30 years SRW Licensors and Producers have teamed with the National Concrete Masonry Association (NCMA) to develop tools and the resources to advance the industry for the benefit of customers and producers alike. Allan Block Corporation has contributed time, intellectual property, and funds to further the state of design, construction, and inspection to the NCMA over this time. There have been several advances that have proven the concept of a required mechanical connection was nothing more than a myth based on unfounded technical opinion instead of true analysis or system performance. In 2002, Allan Block helped to fund SRW performance research under seismic loading conditions through Columbia University with Professors Dov Leshchinsky and Hoe Ling as the principle investigators. Testing on six separate structures, over the course of multiple pseudo static loadings with simultaneous horizontal and vertical accelerations up to 0.8g, it was determined that maximum loading at the face occurred during construction. Additionally the pressure distribution attributed to the loading was an additive rectangular distribution and not the inverted triangle as what many early researchers theorized. To establish the extent of change achieved by having a positive mechanical connection, on one structure, the top grid course was grouted in place between the block courses. After several test runs, it was clearly determined that there was no affect, either positively or negatively, between a positive mechanical connection and a frictional “Rock-Lock” connection demonstrated by the Allan Block system. It was clearly determined that the most important aspect of performance was the spacing between layers of geogrid. With structures tested using grid spacing at 2, 3 and 4 courses, it was clear from the performance of each structure that the only reasonable best practice for design was to limit the grid spacing to the 2 course spacing - 16 in. (405 mm). 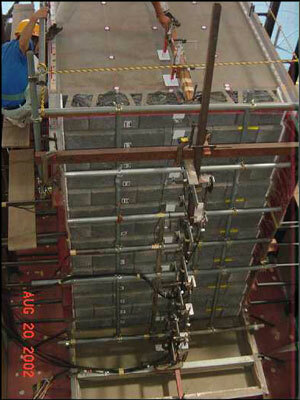 During the five different structural tests using the standard Allan Block lip and notch interlock and “Rock-Lock” connection, there was no evidence of grid pullout from the block. 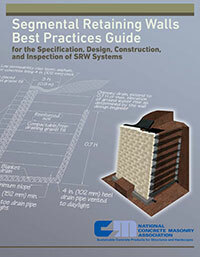 For the past twenty five years, Allan Block Corp. has led the charge to get 2 course maximum grid spacing as the industry standard as evidenced in the Allan Block Best Practices for SRW Design and the NCMA Best Practices for SRW Design, Construction and Inspection Documents. These two Best Practices Documents are being used to educate engineers, contractors and government officials on an industry wide Zero Wall Failures Initiative. 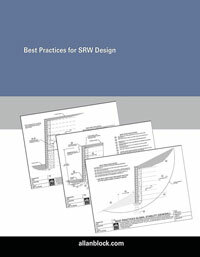 They provide a collection of information that establishes a clear path for SRW Design and Construction. Over the last fifteen years the Federal Highway Administration (FHWA) has conducted research and testing to determine how they could employ the new SRW concepts in design to construct bridge abutments. They call their initiative the Geosynthetic Reinforced Soil – Integrated Bridge System (GRS-IBS). They have established a very impressive path forward to dramatically reduce the cost and time of constructing new bridge abutments using dry stacked blocks with very close (8 inches or less (200 mm)) reinforcement spacing. In many of the test structures and initial applications built, the actual facing units had no interlock at all to substantiate the lack of load at the face of a reinforced soil mass. As these bridge abutments have been used for everything from interstate highway projects to county road projects. If we can use SRW systems to support bridge decks without mechanical connectors, we can clearly demonstrate the need of the positive connection between grid and wall block is nothing but a myth. In summary, the Allan Block system could be configured with and constructed with a positive mechanical geogrid connection, but it would provide only additional cost and no additional performance. As captured in the Best Practices approach, using structural fill and more closely spaced reinforcement provides a better, more structurally secure, system in all cases. For more information please contact the Allan Block Engineering Department for a series of references related to those topics identified in this newsletter. Allan Block continues to hold their status as a leader in the segmental retaining wall industry by creating innovative solutions to various grade change problems. In order to verify these solutions, Allan Block tests each product to ensure that they reach or exceed all industry standards. One of these tests, ASTM D6638 – Standard Test Method for Determining the Connection Strength Between Geosynthetic Reinforcement and Segmental Concrete Units, is used to obtain the connection strength between an Allan Block SRW unit and the geogrid layers used in its construction. In an attempt to increase the connection strength of an SRW, many other SRW systems will place pins or clips between courses of block. It has been proven over and over again that adding these alignment devices does nothing to increase connection capacity. In fact, by adding pins to a wall, the pins can actually create a point load on the grid and can cause more damage, weakening the connection. Allan Block’s solution to increasing connection strength is our patented “Rock-Lock” connection. This connection is created from the compacted aggregate fill in each block core, creating a continuous locking effect with all the apertures in the geogrid layer. The "Rock-Lock" connection is one of the strongest SRW connection capacities in the industry. As mentioned above, Allan Block tests the connection strength between Allan Block SRW’s and various types of geogrid using ASTM D6638. These tests have been conducted at several locations including the NCMA. The ASTM test setup can be seen in Figure 1. First, the lower course of block is secured in place, filled with aggregate, then compacted. Next a layer of geogrid is set in place with its front placed against the front block lip and the tail end connected to a spreader bar that will ensure a uniform tension, or pulling force, is applied to the assembly. The top layer of block is then constructed, filled with aggregate, and compacted. A vertical force (also called the Normal load) is then applied to the top of the block assembly in order to simulate the number of courses above the geogrid layer. The geogrid and the spreader bar are then pulled with a Hydraulic ram at a constant rate until connection failure occurs. 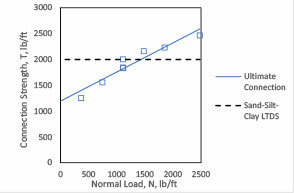 A variety of tests are conducted using various normal loads in order to create a data set of points to create the connection curve shown in Figure 2. It is not uncommon for the geogrid layer to rupture behind the unit before the connection fails, proving that the “Rock-Lock" connection performs phenomenally when put to the test. 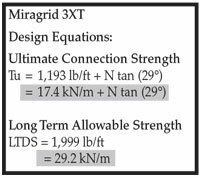 The Miragrid 3XT test results shown above. 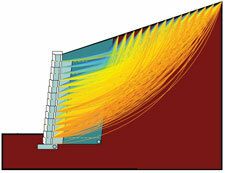 The lack of shear strength between layers of a segmental retaining wall can cause a wall to fail in internal sliding. The shear strength between wall courses is a resistive force that “pushes” in the opposite direction of the sliding forces. The shear strength between layers and grid pullout are vital wall components in regard to internal compound stability when slip planes are present. If the shear strength of the wall is not large enough, the forces on the slip planes will be larger than the combination of shear strength and grid pullout, causing a wall failure. 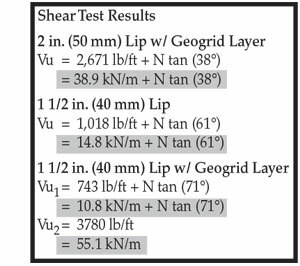 In order to test the shear strength between layers of Allan Block, the blocks were tested using ASTM D6916 – Standard Test Method for Determining the Shear Strength Between Segmental Concrete Units. In the test, two courses of Allan Block were constructed, with the bottom course fixed in place. 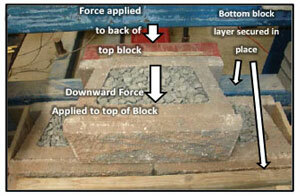 The second course was loaded vertically to simulate the number of courses above, and a force was applied to the back of the blocks in an attempt to push the top layer forward, simulating the active force soil would have on the back of a retaining wall. Figure 3 shows the general testing apparatus. Multiple block types were tested and, in short, Allan Block’s performance was astounding. There are several components to the Allan Block product that led to these amazing test results and are shown in Figure 4 The first component is the unique front lip on each block. The front lip on the block acts as a shear key, which increases the passive pressure on the wall. The second component is the block-to-block friction between layers of the wall. This is simply a friction force that will oppose any movement between the blocks. The last major component is the resistive force created from the interactions of the aggregate that is used to fill the voids in the block. These small rocks catch onto each other and wedge themselves together, and with each aggregate rock that comes into contact with another, the connection grows stronger. In order to test the worst-case scenarios, the tests were conducted with a layer of geogrid placed between each course of block. The reason that the addition of geogrid into the system creates a worst-case scenario is because the geogrid acts as a slip surface, lowering the coefficient of friction between wall layers. 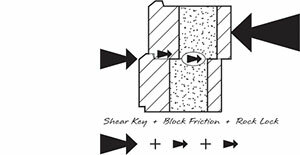 By introducing a slip surface, the block-to-block friction between courses is replaced by a much lower block-to-grid friction force. 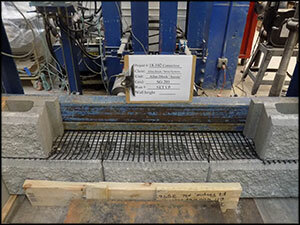 However, because of the effectiveness of the shear key and a “Rock-Lock” connection created from aggregate locking into the geogrid, the Allan Block test results were still phenomenal. In fact, all of the 2 in. (50 mm) Lip block's performed so well, that it was not necessary to test without the geogrid in-between layers. Allan Block continues to support and enhance our AB Walls SRW design software. We have recently released a new version of the software. Enhancements have been made to the live and dead load surcharges function, greater access to our typical details, enhanced printing, and many updates to our worldwide producer network. AB Walls continues to be the ultimate design tool for segmental retaining walls. It allows the designer to not just design a simple cross section like most programs but has many valuable features including the ability to layout detailed elevation and plan views, cut multiple design cross sections along the length of the wall and export all design drawings to a DXF format for use in any CAD program. Along with many other design and detailing functions, the program is capable of providing a detailed set of material quantities including everything required to build the project. Find out more information on how to get your copy of AB Walls from our website at allanblock.com.